You guys as I was loading pictures to this post for Matt’s Birthday weekend I sat back and realized… MAN, he had a GREAT weekend! lol! I mean that was my goal and all but wow! hehe! My parents flew in last Thursday evening for the weekend…. they came for the Broncos game, we try to go to one a year with them and Matt’s Birthday weekend wound up being the best fit AND that way the tickets for all of us to go to the game was his present from my parents and my grandma! Friday night we kicked off the weekend with dinner out at our favorite special occasion place! Guard and Grace downtown and while we were eating the ENTIRE Portland Trailblazers NBA team came in to eat! Kinda cool! Mom and Dad LOVED dinner too….. since they got the Broncos tickets Matt and I actually treated them to the steakhouse dinner! And for those of you who asked about my top on Facebook it is Free People and I got it recently, my “pleather” leggings are from Nordstroms! Saturday Mom and I set out to go shopping before our tailgate prep started and Dad and Matt got a BIG surprise! 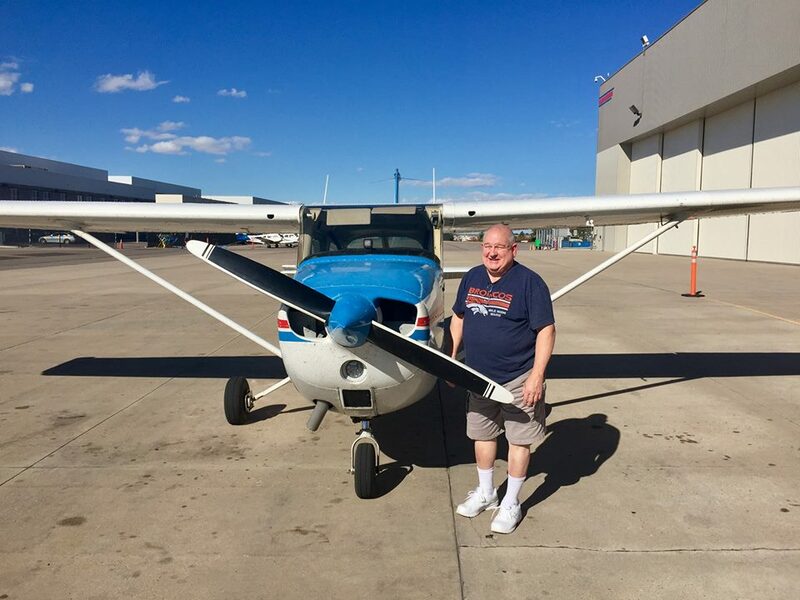 My Dad is a private pilot and his plane is in Oklahoma but I found a great plane rental company here in Denver and set it all up for Dad and Matt to fly around Denver for the afternoon! They were super excited! Here is just 1 of Matt’s pictures from the plane, and they even did a low fly over of our house! Mom and I were outside on the deck waving… it was super cool! 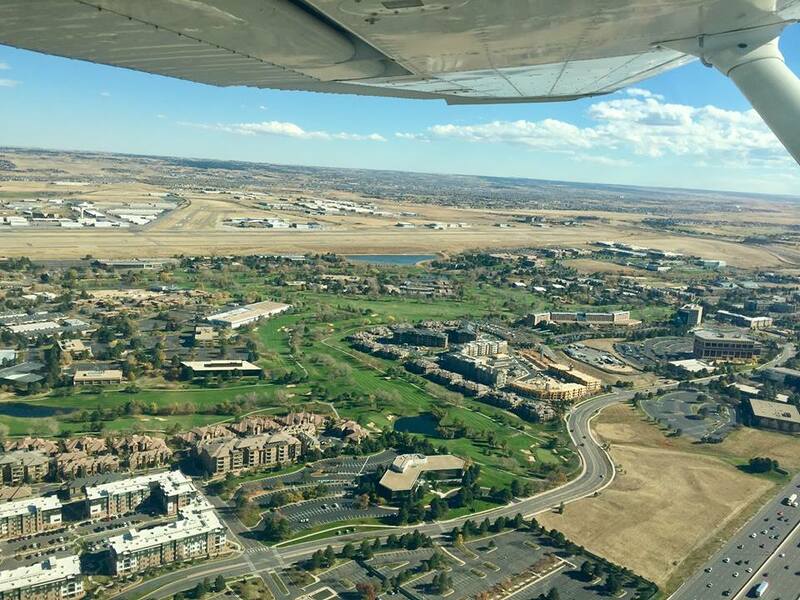 They flew over the foothills, Red Rocks, Denver and had a wonderful afternoon in the sky! Sunday for the game I organized a tailgate of Matt’s friends and we had a good turn out, around 15-18 people stopped by and thank you to those of you who did! We had games, music and a TON of food that Mom and I made… plus Matt manned the grill! This game was on Matt’s actual Birthday which was so neat….. plus a Broncos WIN! Go Broncos! These are two other Farmers District Managers who stopped by to wish Matt a Happy Birthday! I love their fro’s! Guess What??? We had 3rd ROW TICKETS! It was awesome being so close to the action and we were right by the Cheerleaders which I LOVED! OMG They gave out Vampire Miller masks and we loved them….. Matt and Mom demonstrate here! This is how close we were… NO ZOOM! Matt had a wonderful weekend which made me happy but come yesterday we were all super tired! Mom and Dad are back in Oklahoma and it’s back to the real world I guess! BOO hiss! Go Broncos!!!!!!! Happy 36th Matty! What a birthday! It is going to hard to top this one, looks like so much fun was had though! Happy late Birthday Matt!